Finally! The promises of spring are here…and that includes enjoying your deck. After what seems to have been an especially long winter, the signs of spring are starting to show themselves with a little bit of sunshine, some budding plants and trees, and slightly longer daylight hours. For many of us, those are the first signals for the beginning of deck and patio season. We get that spring-time rush of anticipation for barbecues, family events and social gatherings that take place at our favorite outdoor living spaces in the coming months. But to make the most of deck and patio season – and get all of the quality outdoor living time that you can – start off by giving your deck or patio a really good post-winter clean to start the season off right. Do I Need to Clean my Deck Now? Yes -Now is the perfect time to give your deck a really good cleaning to prep it for a long season of enjoyment. Even if you don’t think you are going to use your deck much until the weather gets warmer, now is the time. If you enjoy the benefits of a vinyl waterproof deck surface, you don’t have to wait for any ideal conditions for annual maintenance. 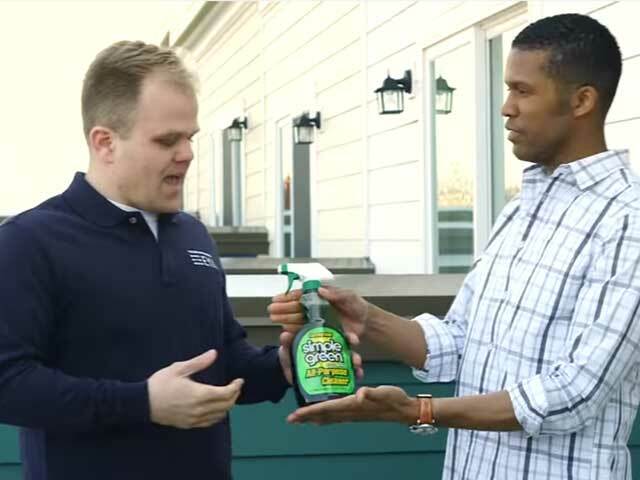 All it takes is a light scrub to get your deck in shape for the spring season. Duradek deck owners can happily start enjoying their outdoor spaces while neighbors with wood decks are procrastinating the labor-intensive maintenance required before the leisure time begins…but even Duradek decks need a little TLC in the form of cleaning. 1 – Give your deck a seasonal cleaning. Cascade Powdered Dish Detergent (diluted) – this is our most commonly recommended household solution. 2 – Give your deck a gentle scrub. Use a soft-bristled broom or brush. A stiff bristle brush or broom may be required for stains, but be careful to not apply too much pressure to wear down the embossed pattern of your vinyl. The real trick here to make the work easy is to use warm water. While Duradek is manufactured with UV and mold inhibitors, in some rare cases mold growth can be a frustrating issue. It will require a little more work to clean. If you are experiencing mold on your Duradek, you may want to read this article on mold removal that discusses this tricky subject and features an excellent case study by Duradek MidAtlantic on how to identify and combat mold. 3 – Be sure to rinse off all cleaning residue very thoroughly. If you’ve used rock salt or other ice melting chemicals throughout the winter months, you need to give your deck a thorough cleaning before the sun can ‘bake’ any of those chemicals into your deck surface. Cleaning your deck is a comparatively easy, maintenance-free alternative to the sanding, staining, painting, and sealing required from other deck systems to keep it looking great. Just invest the few minutes it takes to clean your deck seasonally and you will have a deck you want to show off for many years like these happy Duradek deck owners. EYA Builders, twice named America’s best builder had made good use of thoughtfully planned spaces in their homes which often includes roof decks waterproofed with Duradek. With over 4,000 homes in over 30 neighborhoods in Virginia, Maryland and Washington DC, EYA Builders takes great care of its customers by providing maintenance advice for various features of their newly built homes. This video on cleaning Duradek is one of the ways EYA helps its customers enjoy the fabulous features of their homes and we thought we’d share it with you. If you don’t yet have a Duradek deck and would like a free estimate for the best option in low maintenance decking, contact a Duradek dealer in your area. We hope you enjoy creating countless happy memories on your deck!